Scotland's Rig Yards - Nigg 1974 BP Highland 1 Inside the Flotation Tank. 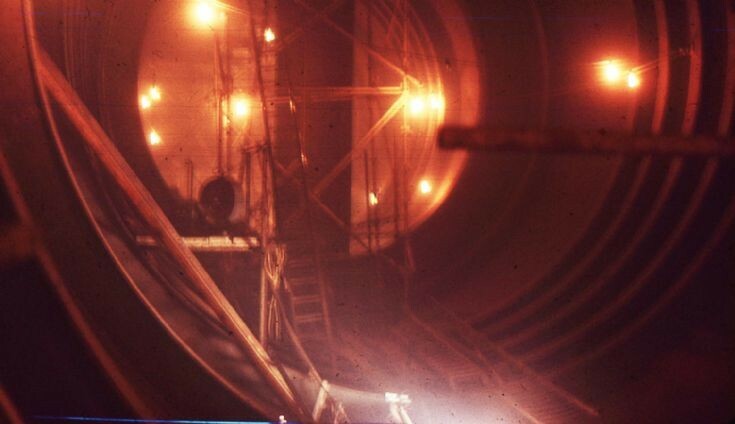 Nigg 1974 BP Highland 1 Inside the Flotation Tank. No flash no tripod and very bad light. I think these tanks were 30 foot diameter. I worked in these tanks for the first 2 or three shifts after I started on the site at the beginning of January. Must have been February actually. I was 7 1/2 weeks in the welding school before that. Think the teacher was named Robbie Shepard from Cromarty. I was his best student. Willie Mackintosh's best student, a freak from Lewis passed the test the day before I did. "10 Week Wonders, " we were not. We were. "Less Than 8 Week Wonders, " And some of us a good deal better welders than several time served welders I came across. Overthe months in Nigg I gouged and rewelded a lot of othere people's work. Dougie would take me to some new place and there were a load of lines in paint or something, saying things like, "Slag 2" below." You saw the slag as you gouged down into it and then you had to start rewelding it. The gouging was a filthy noisy job. Added by Alan Bush on 03 November 2013. The teachers name was Alan I worked on 1 and 2. Added by Thomas COllins on 28 January 2016.